If you are keen to take a DIY approach to your website with some professional web designer support, then I am happy to help. Taking a DIY approach will enable you to take charge of your website and it can save you money if done properly. By working with a professional designer you can avoid some of the very steep learning curves as well of some of the pitfalls involved in getting a website up and running. Read Why pay for web design when there are free website builders? to understand why choosing WordPress is a better option than other website builders. We help customers help with their Wordpress Websites. Hire Tarnya, WordPress consultant for a range of support for your site. I also offer SEO services especially for WordPress sites to grow your website traffic and rankings. We offer a range of WordPress Maintenance and Care Plans. Our website care plans include software and security updates including WordPress core, theme framework and plugins, maintenance services, daily cloud backups, 24/7 Uptime Monitoring, WordPress Database optimisation, Spam and revision cleanups, ongoing support tasks each month, and monthly reporting. Get More From Your WordPress Website. Sign up to receive monthly tips. Margaret was discouraged with their existing WordPress website. She found it difficult to update and and she could not get it looking professional. She had extra information that would help their customers but she had not been able to include it on the website. She felt the structure of the site was not helpful. Consequently, she can to me: Could I help improve their site? Innohome Inspections engaged us to improve organic search results ie when searching on Google. Of first importance, they were not ranking for their important keyword phrases and secondly were paying a considerable amount to Adwords each month. They hoped by taker a longer-term approach by investing in their website they would save in the long run while achieving the same number of results. Sandra, a long-standing client, came to me initially to create a website for her floral design business. We continue to work together to grow her online business. Sandra provides stunning Wedding Flowers with an offering of wedding packages for the budget conscious and custom bespoke design services for unique weddings. She provides personalized services with inspirational floral designs which is reflected throughout her website. She describes her design style as big and bold, from the contemporary “just-picked from the garden” to the modern elegant and artistic designs. WordPress is a free open-source content management system that operates over 28% of the websites in the world. Consequently, it is widely used and here to stay for a long time. It is also user-friendly. Enjoy peace of mind with WordPress Website Care Plan. In the event, your site is hacked or something goes wrong with your hosting, we can get your site up and running quickly. Is your WordPress site backed up? Whether you are wanting a new website or website redesign, we can help. 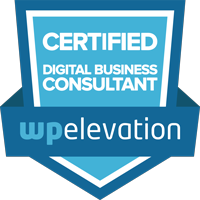 For the small business, our WordPress design projects start with understanding your business goals. We focus on your customers, their experience and creating call-to-action with the intention to deliver a good return on your investment. If you need a bit of WordPress Help, we offer WordPress Support Services Auckland on a per hour basis. Setting up WordPress on your hosting account including pointing the domain at your hosting and your SSL certificate. Customising the WordPress Theme you have chosen to match your branding. We can give you advice regarding choosing a domain and WordPress Hosting. Configuring a new theme on an existing WordPress website. Web design tweaks to match your branding including custom fonts and colours. Connect your site to Google Analytic, Search Console and integration with your Google My Business Listing. Whether you are a complete beginner or just want to polish up your skills, I can help. We can help you to manage and update your site. I can provide tuition face to face on Skype or in person. We can also create custom documentation and videos for your staff. We recommend a number of web hosting companies that offer different options from specialist Managed WordPress Hosting to Affordable Quality Shared Hosting. You are welcome to discuss your requirements with us. Not sure where to start? Or what are the next steps? Give me a ring and let's have a chat. We are experts in installing and configuring the Woocommerce Plugin for you E-commerce Website as well as giving you additional functionality with premium Woocommerce plugins. Woocommerce is the ecommerce solution for over 30% of all online stores? There are many free extensions (over 1000) in the WordPress plugin Directory that work with Woocommerce. For example, I use the Genesis Connect for Woocommerce plugin that makes the Genesis Framework seamlessly integrate with Woocommerce and the Genesis Trump Style plugin which makes the theme styling the priority rather than the default styling within Woocommerce. Sometimes if you require additional functionality, you may need to purchase a premium plugin. These vary in price from $10US to $250. They extend Woocommerce's functionality and in general They significantly reduce the need for WordPress developer services. Check out Field Editor: This provides an easy way to add, edit and remove fields on the checkout page. This means you can collect extra information from your customers or remove unnecessary fields. If you have a whole form of information to collect from your customers eg registration for a special event then I recommend Gravity forms for Woocommerce. WooCommerce Subscriptions: For selling subscriptions through your store. Product Vendors: For creating a marketplace like Etsy on your site. WooCommerce Social Login: Provides social login for customers. Table Rate Shipping: This provides a great deal more shipping options for your store. Groups for WooCommerce: For sites that sell membership. Catalog Visibility Options This makes your store function like an online catalogue. Gravity Forms Product Add-ons: For adding forms to a product eg event registration. Advanced Notifications: More options for sending out emails when an order is placed. Print Invoices & Packing lists: Provides additional options for printing out invoices and a packing slip. We also offer web development services. Including solutions for clients where out-of-the-box solutions do not meet the requirements. We can create unique extension plugins. For example to cater for your exact requirements including integration with your existing stock management system. Here are some Resources for WordPress Multisite. WordPress for Education: This is a series of tutorials on Lynda.com about how to set up and use WordPress Multisite for Educational Organisations. Note Lynda.com is free with an Auckland Library card. In many cases, multi-site is not the best option for a group of websites because it creates a whole level of complexity. Please read this article Don's Use WP Multisite by Half-Elf on Tech (Mika Epstein) or watch the video below. Don't use it to host lots of small client websites - do separate installs. That seemed obvious to me. Having said all of the above, there are circumstances where a multisite installation is the best choice. The dynamic nature of SEO means that advice from even two years ago may not now be relevant. But having a simple website is now no longer sufficient. You need marketing tools like SEO to get to the top of search lists. The real challenge is to find honest, basic SEO services. That is where I come in. My SEO services will grow your website traffic and rankings AND show you how SEO works. We offer strategic planning for your Digital Online Marketing Strategy including social media, email newsletters, SEO, landing pages as well as the technical support and training for you to implement it. We have considerable experience with Small Business Web Design and our Web Design approach drives is focused on Small Business Marketing.